I hope you all had a wonderful Christmas! Mine was wonderful. I spent the whole day with family. The best part of the holiday celebrations though was probably enjoying cheese fondue with Derek. When we first got married we wanted to make some of our own family traditions. One of them was to have cheese fondue a day or two before Christmas. We both are cheese lovers! It took us 3 years to finally find a recipe we love! We didn’t want a recipe using alcohol so I searched the internet until I found one that looked good. 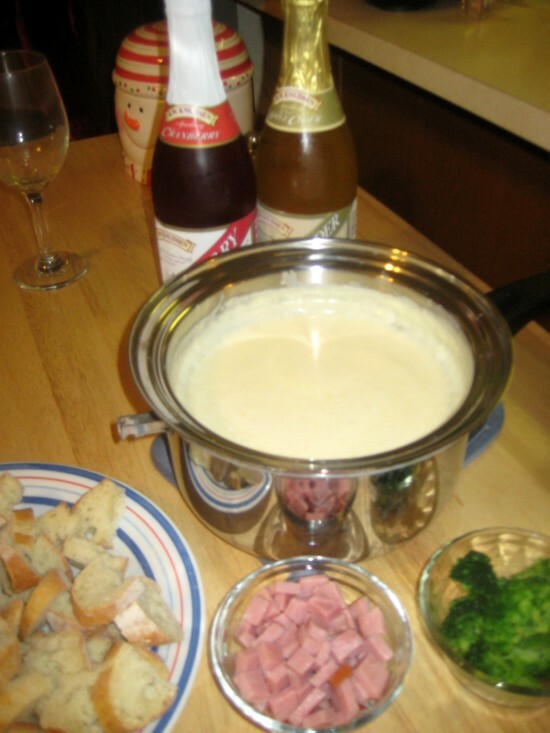 The one I found uses heavy whipping cream and a touch of cream cheese to give the fondue a nice creamy texture. We found one we liked but changed it around to fit our tastes and our wallets. We wanted to get gruyere cheese but even a small block of it was $10. So we used Swiss instead which we already had. We were so excited to try it! The night before Christmas Eve after Levi had gone to bed we made it together then sat down with our sparkling cider. When we took our first bites we were so excited! After 3 years of trying different recipes we had found something truly amazing! We had it with bread (a baguette), broccoli and ham. We can’t wait until next Christmas to have this again! In fact, I’m sure we’ll have it again sometime before then. I am so excited to share this recipe with you! 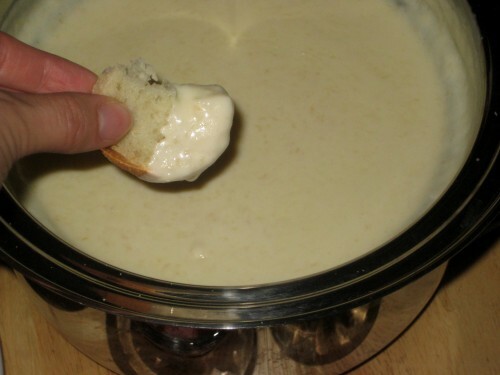 In a fondue pot or double boiler over medium-low heat, add the olive oil, cream cheese, and cream. Stir until smooth. Then add the Parmesan and Gruyere cheese until the mixture is smooth and the cheese has melted. Add the garlic powder, nutmeg and salt. Mix well. *If the mixture is too thick, add more cream, if it’s too runny, add more cheese. Remove from heat if using a double boiler and enjoy! Bread (baguette, French bread etc. ), broccoli, ham, cooked potatoes, apples, pretzels etc. I found this via Pinterest. I made it for NYE last night and it was a huge hit! I used Gruyere and Romano instead of Parmesan. I could eat it every day. Thank you! Brenna- I’m glad it was a hit! I haven’t tried it yet with Gruyere cheese but that sounds so good. I love that cheese!